Every year, around 3 million tons of plastic are used in new electrical and electronic equipment. In the separately collected electrical and electronic waste equipment (WEEE) there are many types of plastics that are used in electrical and electronic products. The most common are HIPS, ABS, PP and PC or PC-ABS. These plastics may contain brominated flame retardants (BFRs) and some of these BFRs are restricted because they are classified as Persistent Organic Pollutant or POP. 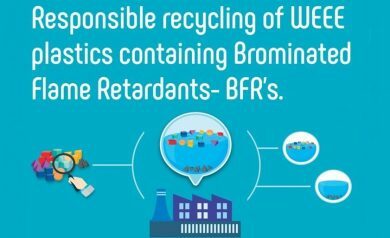 The vast majority of WEEE plastics do not contain brominated flame retardants. Plastics with BFRs are typically used in devices that generate heat, such as CRT televisions and monitors, IT devices such as printers or copiers and cables, circuit boards and connectors. EERA, the European Electronics Recycling Association, has now developed a brochure that describes in a simple way how compliant recyclers of WEEE treat these mixed plastics using best available technology in accordance with the WEEE and POP regulations. About 1.2 million tonnes of mixed WEEE plastics are produced from the separate collection of Waste from Electrical and Electronic equipment (WEEE) in Europe. Of these, only about 300,000 tons are delivered to specialized recycling plants such as MGG Polymers for processing into post-consumer recycled PCR plastics. So about 75% of WEEE plastics are exported from Europe and it is not known how much is recycled as PCR plastics or what happens with the POP BFR containing plastics. The better solution is to carry out this plastic recycling in Europe in line with European legislation. However, the complex rules in Europe often do not make this easy, above all because the rules are often not interpreted uniformly. For this reason, the European Electronics Recyclers Association EERA has drawn up a simple treatment guide based upon the Cenelec processing standard EN 50625 for WEEE. Many product categories do not contain BFR’s or only traces of these BFR’s. The general treatment regulations of this standard describe that with a threshold value of below 2,000 ppm bromine there are no risks that the POP flame retardants can exist in the plastic mixture at the regulated levels fixed by EU and by international conventions. If more than 2000 ppm elemental bromine is detected in these bromine analyses – or if no analyses are performed – it is assumed that the legally prohibited BFRs may be present at levels above these regulatory limit values. Further separation then has to take place by specialized plastics recycling plants such as MGG Polymers. For cross border transports notifications are then required, particularly in Austria. MGG Polymers has the status of a pre-consented treatment facility, which should largely facilitate quick notification processes. In the recycling process, the BFR containing plastics are concentrated together with the non-recycled plastics and this fraction is incinerated for thermal recovery. This incineration process removes the brominated flame retardants from the material cycle. If all plastics from WEEE were to be recycled in Europe according to this EERA guidance, an estimated 2.5 million MT. CO2 emissions savings per year would be the result compared to the production of virgin plastics. Recycling of these WEEE plastics in Europe thus makes a lot of sense. Click here for more information about EERA. Click here for more information about MGG Polymers.